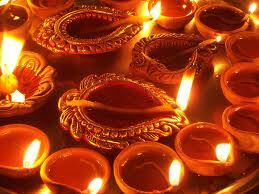 Deepavali or Diwali is celebrated as the ‘festival of lights’ all over India. In Kerala, Deepavali falls in the Malayalam month of Thulam i.e. October-November. Astrologically, on Deepavali day, the sun moves into the Zodiac sign Libra that signifies commerce. Therefore it is the most important festival for the merchant community. In kerala Deepavali is not a major festival and is celebrated with great enthusiasm by the Hindus, Tamil, Bengali and other different North Indian Communities(merchant community) who reside in Kerala. According to legend, Deepavali is celebrated to commemorate the victory of Krishna over the demon Narakasura.On the day of Deepavali, people awake early in the morning and all hindus families fully decorate their homes with oil lamps lights. By lighting the oil lamps, the Hindus are thanking the gods for the happiness, knowledge, peace and wealth that they have received. Goddess Lakshmi, the goddess of prosperity is worshipped during this Deepavali festival. some of the popular sweets distributed in Deepavali days are laddu, halwa and burfi. On these days, people love to eat spicy food and non-vegetarians food is prepared like chicken tandoori, prawn sambal and fish head curry.